All was industry as I drove along the famous D2 into the Medoc. As always the pulse quickens just by a beat or two as one famous Château after another looms up: Beychevelle, Ducru Beaucaillou, Léoville Las-Cases… But whilst these roads and villages are normally amongst the sleepiest in France (behind imposing gates, the pristine Châteaux are mostly open only by appointment), just a week before the harvest workmen are digging drainage channels, tractors move like giant creatures amongst the vines, and workers apply a liberal dose of spit and polish in readiness for the bounty of this year’s crop. I was here to meet one of the most remarkable men in the world of wine and to learn more about his unique position in a unique company. It was also a chance to visit three Bordeaux estates that are just part of the international portfolio under his management. Christian Seely (right) is impeccably dapper as always, in Savile Row (I’m guessing) tailored navy blue suit, topped with his crown of curls and sporting his signature bow tie. “Let’s take a walk,” he says almost immediately, and we exit the discreet back door of the magnificent Château Pichon Baron, crunch across the gravel, and plunge straight into the 40 hectares of vines that surround the property. Christian Seely’s father James was a well-respected restaurateur, wine journalist and author. When the 23-year-old Christian graduated from Cambridge, an opportunity arose to accompany his father on a six-month tour of Bordeaux to research a book on the region. “We visited 130 Châteaux, and I knew then that one day I would have to find a way to be part of this,” he tells me. This immersion in the world of Bordeaux seems to have cemented his love of the region, and of wine. Christian returned to London and began work with the idea of making a fortune in the city: “Enough to be able to perhaps one day own my own Bordeaux Château.” Though he insists that level of fortune did not accrue, his career flew pretty high. He worked, and then gained an MBA in Paris, before spending several years back in London as ‘troubleshooter’ for a venture capital company where his specialism was turning around failing businesses. It was in 1993 – and perhaps still dreaming of amassing a château-shaped fortune – that he heard on the grapevine that AXA, the French finance and insurance giant, had acquired the renowned Port house of Quinta do Noval (left). Knowing AXA’s track record for purchasing waning but once great estates with the purpose of restoring them, he rather impertinently applied for the job of running Noval – a job which didn’t actually exist, and for which he seriously lacked experience. Somehow Seely’s eloquent petition worked, and soon he was packing up life in England to head to the heat and the challenges of Portugal. After seven years there, Noval still holds an obviously special place in Christian Seely’s heart (as I reported in 2011). But when a call came from AXA offering him the opportunity to take over as Director of all of AXA’s estates, it was an offer he would not refuse. In 2000 he succeeded Jean-Michel Cazes as head of AXA Millésimes, settling into their HQ within Château Pichon Baron in Bordeaux to oversee a portfolio of the finest – or potentially finest – wine properties across France and beyond. It is not unusual for insurance giants to invest in Bordeaux châteaux. But what makes AXA’s involvement different is the way that the running of AXA’s ‘Millésimes’ division is entrusted to Christian Seely, and Christian’s relationship with the main AXA board in Paris. Christian Seely is positively proprietorial about the estates under his control, not in a pompous self-aggrandising way, but simply by the fact that he lives and breathes these properties, with a clear and constant vision for them that always – always – centres on excellence. Of course he is a shrewd and I dare say tough business man, running a multi million pound division of a company and answerable to a remote board of shareholders. But it is a passion for wine that drives him. It really is. I have now met the Technical Directors (day to day winemaker/managers) of five of his properties, and the obvious respect they have for him is matched only by their affection. Today, AXA owns Quinta do Noval in the Douro, the Bordeaux châteaux of Pichon Baron, Pibran, Petit Village and Suduiraut, Disznokö of Tokaji, Domaine de l’Arlot in Burgundy and Mas Belles Eaux in the Languedoc. In each case Seely explains that AXA sees the properties as a long term investment, and that the board is normally content to follow his recommendations of investment to improve quality, and ultimately, the value of each estate. 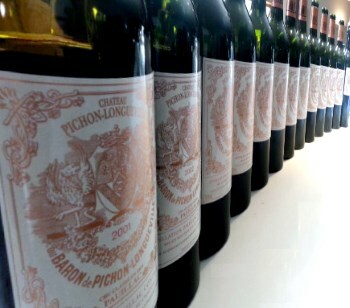 Pichon Baron is one of the greatest Bordeaux estates, a ‘super-second’ and renowned as a great terroir. Its vineyard is bounded on one side by Château Latour, on the other by Château Pichon Lalande. Christian arrived here in 2000, to an estate that had experienced a serious decline in its fortunes over the decade before. 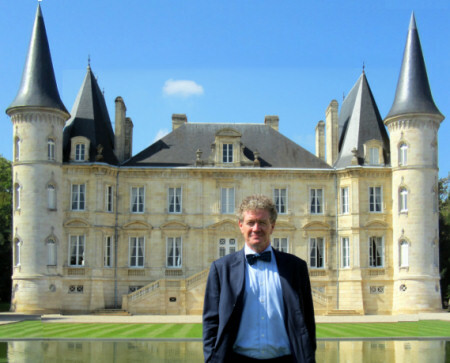 The trio of vintages between 1988 and 1990 were exceptional for Bordeaux, and for Pichon Baron, but perhaps that success led to over ambition, with 32 hectares of new vineyard planted a short distance away to supplement the original 40 hectares planted on the same famous plateau as neighbour Latour. The new vineyard had far less gravel content, and the soils were more suitable for the early-ripening Merlot than Cabernet Sauvignon, the backbone of Pichon Baron and of the Médoc. Through the early 1990s the inclusion of this fruit diluted quality as production soared to 400,000 bottles. One of Christian Seely’s first decisions was to demote the entire crop of the newer vineyard to the second wine. First wine production fell to around 150,000 bottles, a strategic decision that surely must have been a tough one to explain to the money men of AXA. But Christian’s charm, determination and chutzpah seemed to rule the day and, of course, he was proved right as the esteem of Pichon Baron began to build once more, lifting it once again to the upper echelons of Bordeaux. Much further south and east of Pauillac, beyond the city of Bordeaux, the vineyards of Sauternes rise from the banks of the Rivers Garonne and Ciron, the gravel soils on clay, chalk and limestone, where Semillon, Sauvignon Blanc and a little Muscadelle are grown, mostly to make sweet wines – though most estates make dry white wine too. 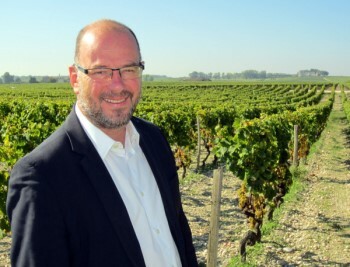 I was greeted by Pierre Montégut, the estate’s Technical Director since 2004 and in charge of both vineyard and cellar. Although the harvest had begun, Pierre appeared to be remarkably relaxed as we took a stroll out into the vineyards which abut the famous Château d’Yquem. The text book explanation for the magical propensity of Sauternes’ vineyards to develop Botrytis centres around their proximity to the river. The story goes that early morning mists emanating from the river cause the Botrytis spores to settle on the vineyard, before the warming afternoon sun dries the grapes. However Pierre believes that whilst romantic, it’s not as simple as that: Suduiraut and many of the best properties sit on a plateau well away from the river, and yet the climate produces Botrytis reliably. The magnificent Château, with its formal gardens designed by Le Nôtre, exudes confidence, yet Pierre confesses that Sauternes is a tough sell in today’s market. Indeed controversy has surrounded another top Sauternes wine, Château Rieussec, which is owned by the Rothschild family. In recent years wine merchants have been ‘forced’ to buy cases of Rieussec if they wanted an allocation of the Rothschild’s Château Lafite. Suduiraut produces a very good dry wine, but Pierre’s passion is for the superb sweet wines for which the château has been renowned for centuries – it was declared a ‘Premier Cru’ in the great Bordeaux classification of 1855. The vineyards are mostly over 30 years old and planted 90% to Semillon, 10% to Sauvignon Blanc with no Muscadelle. All work is by hand and only organic fertilisers are used. 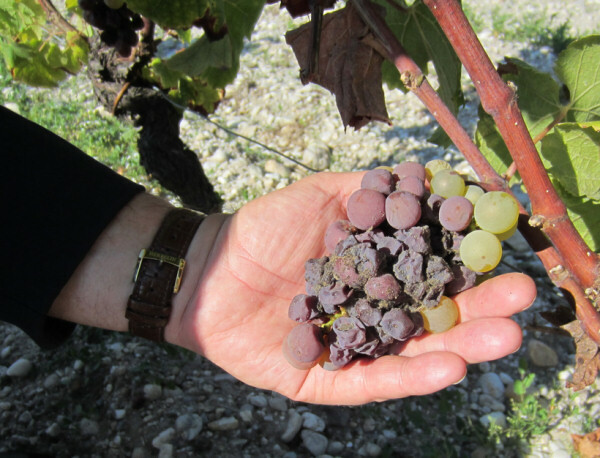 Harvesting may be done in several ‘tries’ or passes, but often whole clusters containing both Botrytis-affected and ripe grapes are harvested together to give a natural balance. Pomerol is a tiny appellation on Bordeaux’s Right Bank, the subject of much attention because of super-expensive wines like Châteaux Le Pin and Pétrus. With one of its two parcels of vines adjoining Le Pin, Petit-Village sits on the same ‘Plateau de Pomerol’ with deep clay soils covered in stones. I was greeted by charming Technical Director, Marielle Cazaux (right). Her family comes from the Landes, south of Bordeaux, where they run a small cellar where she grew up helping each harvest. “I decided I wanted to work outdoors and in agriculture,” she tells me, and making wine seemed the logical step. 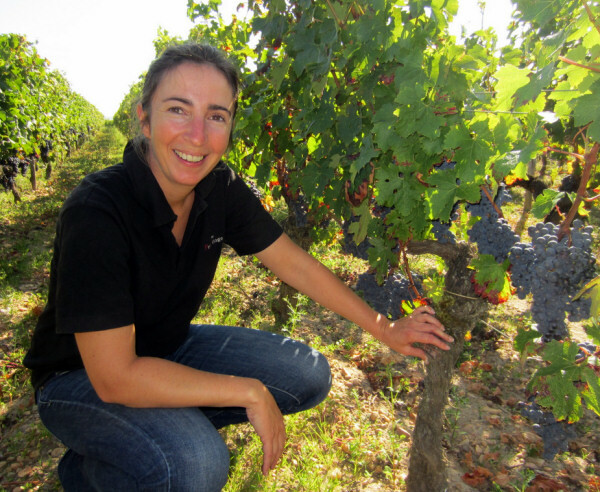 Having trained in Bordeaux she spent several months working with Ridge Vineyards in Sonoma and Montebello, Californian, and took up her current role in 2012. Stéphane Derencourt has been consulting at Petit Village since 2006. Half of the vineyard is blue clay “like Pétrus,” and half gravel. It is planted with 75% Merlot, 18% Cabernet Franc and 7% Cabernet Sauvignon. “The old vines and the old terroir are good for Cabernet Sauvignon,” Marielle tells me. The average age of the vines is 32 years. 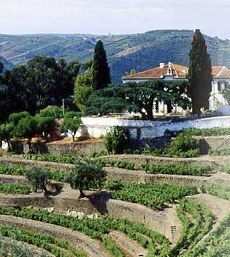 The 10.44 hectares were purchase by AXA from the Prats family in 1999. Some very old vines planted in 1948 and 1956 are still in very good condition, but Marielle is replacing small portions gradually. In terms of winemaking, the state of the art winery built recently is flooded with light and Marielle has been reorganising the space for reception and sorting of grapes to make the process more accurate and efficient. I ask if it was difficult to be accepted in the world of Pomerol as a young female winemaker: “No,” she replies, “I use a combination of my own knowledge and experience and the power of the woman.” When I ask her to explain that power there is a twinkle in her eye, but the only response is a laugh.